You are here: Home / Blog / What are permalinks? OK, it’s getting to sound a little bit technical here, not something for the newbie, right? Well, actually, no, it’s not really technical at all. Just kind of a techie sounding word, but it’s really simple. Permalink? What the heck is a permalink? A permalink is a URL that points to a specific blog or forum entry after it has passed from the front page to the archives. Because a permalink remains unchanged indefinitely, it is less susceptible to link rot. Most modern weblogging and content-syndication software systems support such links. Other types of websites use the term permanent links, but the term permalink is most common within the blogosphere. Permalinks are often simply stated so as to be human-readable. Nothing really to worry too much about, it’s just the URL of your article. For example, the permalink for this article that you are reading is: http://soupupyoursite.com/what-are-permalinks/ nothing difficult about that, right? But, in WordPress, did you know that there is a way that you can set the Permalink to a certain setting? You can set up the permalink where it includes certain things, like the date of the post, category or other things, or you can set the permalink where it is just the name of the blog post. Of course, it will have the site information in the front, but the place where you can affect the permalink is the ending part of the URL. Now, most people just leave the permalinks as they are set up by default in WordPress. The experts, though, set them to some custom value. In most cases, when you set up WordPress it has the permalinks set up to where it has a “post number” instead of the post name. To be honest, this is a poor setting, it is not search engine friendly. Instead, you should change the permalink settings to show the post name, and other information if that is what you want. For me, I prefer to use the “Post Name” setting for my permalinks. It creates a simple URL, and also allows me flexibility on my blog. For example, if I want to update a post at a later date, or move that post to the top of my site, I can do so without the URL changing. 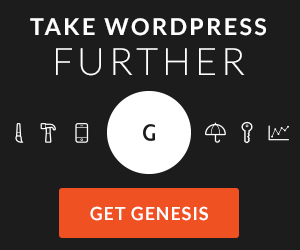 In order to change the permalinks settings for your blog/website using WordPress, it’s quite easy. 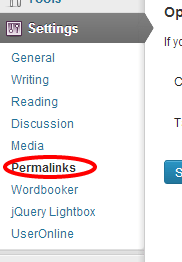 First, go to the Settings tab in the Admin area of your site, then click on Permalinks. This will bring you to a special page that allows you to alter the permalink settings. Once you get to that page, you will be given different options for the setting that you want. You will see a number of pre-configured permalink settings to choose from, and there will also be a place where you can write the setting yourself for something more customized than the standard setting choices. This “write it yourself” area is really reserved for more advanced users. If you do not really know what you are doing, I’d recommend just sticking with one of the pre-written settings that WordPress provides. My personal choice is to use the “Post Name” setting, as I mentioned earlier. The .htaccess file is a file that is in the directory where WordPress resides. It basically gives information to web browsers to tell them things they need to know about your website. The .htaccess file will be modified with different “re-write rules” for this permalink setting. Don’t worry, it’s nothing too hard, and in most cases it will be set for you by the WordPress Software. Whether it is set or you have to change the file depends on the configuration of your WordPress installation. For most of the big hosting companies, like HostGator or BlueHost, they are set up where everything is automatic. So, check out your permalink settings, and decide if you could benefit by changing them.